Anointed “South Africa’s cultural ambassadors to the world” by Nelson Mandela, five-time Grammy Award-winning a cappella group Ladysmith Black Mambazo has warmed the hearts of audiences worldwide with their uplifting vocal harmonies, signature dance moves, and charming onstage banter for more than 50 years. Since the world discovered their powerful vocals in Paul Simon’s 1986 album, Graceland, the original members have welcomed a younger generation of singers into the group to pass along the tradition of storytelling and help spread their message of peace, love, and harmony. 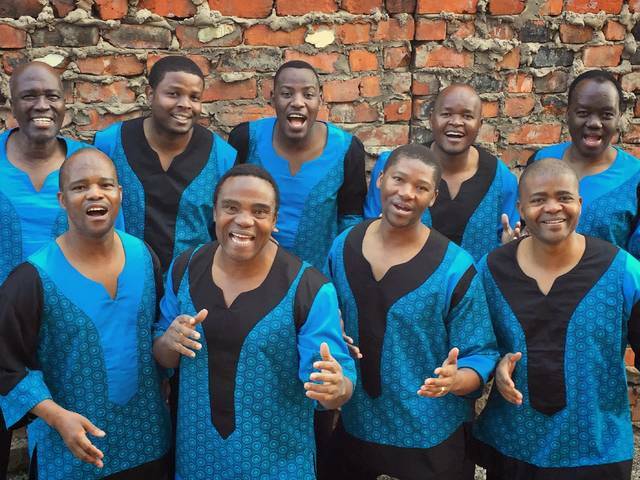 CAPA presents Ladysmith Black Mambazo at the Lincoln Theatre (769 E. Long St.) on Tuesday, February 19, at 7:30 pm. Tickets are $31.50 and $36.50 and can be purchased in-person at the CAPA Ticket Center (39 E. State St.), online at www.capa.com, or by phone at (614) 469-0939 or (800) 745-3000. Assembled in the early 1960s in South Africa by Joseph Shabalala, then a young farm boy turned factory worker, the group took the name Ladysmith Black Mambazo – Ladysmith being the name of Shabalala’s rural hometown; Black being a reference to oxen, the strongest of all farm animals; and Mambazo being the Zulu word for axe, a symbol of the group’s ability to “chop down” any singing rival who might challenge them. Their collective voices were so tight and harmonies so polished, they were eventually banned from competitions, although they were welcome to participate strictly as entertainers. A radio broadcast in 1970 opened the door to their first record contract. Their philosophy in the studio was – and continues to be – just as much about preservation of musical heritage as it is about entertainment. The group borrows heavily from a traditional music called isicathamiya (is-cot-a-ME-ya), which developed in the mines of South Africa, where black workers were taken by rail to work far away from their homes and their families. Poorly housed and paid worse, the mine workers would entertain themselves after a six-day week by singing songs into the wee hours on Sunday morning. When the miners returned to their homelands, this musical tradition returned with them. Thus began an ambitious recording career that currently includes more than 70 albums, 19 Grammy Award nominations, and five Grammy Award wins for Shaka Zulu (1988), Raise Your Spirit Higher (2004), Ilembe (2009), Singing For Peace Around the World (2013), and Shaka Zulu Revisited (2017). COLUMBUS, Ohio – African-American women at high risk of breast cancer are less likely than white women to pursue potentially life-saving preventive care, and racial disparities in health care and elsewhere are to blame, new research suggests. “African-American women faced additional burdens at every step along the risk-management journey,” researchers from The Ohio State University wrote in a newly published study in the journal Ethnicity & Health. The study included in-depth interviews with 50 women – 30 white, 20 black – deemed at high risk of breast cancer based on family history and other factors. They found that high-risk black women were less likely than white women to have genetic testing, take medications to protect them against cancer and to have or consider having their breasts or ovaries removed as a preventive measure, disparities that have been seen in previous studies. For example, 67 percent of white study participants said they or a relevant family member had undergone genetic testing, while just 20 percent of black women reported a history of genetic testing. This study broke new ground as the first to help explain the reasons behind the racial differences. It showed that black women were less aware of their options and at a disadvantage when it came to getting access to information about prevention. Only three of the black women in the study, or 15 percent, had seen a specialist for their breast health. Meanwhile, 70 percent of the white women had consulted with a provider with special training. Lead author Tasleem Padamsee said she expected differences by race. After all, health disparities between blacks and whites are common in various cancers and in other diseases. But this was the first study to look at differences in proactive prevention decision-making, and to drill down beyond those differences in an effort to explain why high-risk black women might make different choices than white women with the same risk. After analyzing the feedback they received from study interviews and comparing it with preventive actions taken (or not taken) by those women, the researchers found that African-American women on the whole experienced differences in three separate “layers of information” that contribute to their decisions about managing cancer risk. Those layers include receiving specific information about preventive care options, including genetic testing and prophylactic treatment; general information about managing breast cancer risk; and basic perceptions of breast cancer risk and prevention. “We wanted to understand what women’s experiences are like, how they make choices, and what influences those choices,” said Padamsee, an assistant professor of health services management and policy and a member of Ohio State’s Comprehensive Cancer Center. Interviews were wide-ranging and revealed trends, such as a higher likelihood that African-American participants were burdened with other health care concerns, both their own and their family members’, Padamsee said. These trends could help inform care provided to women in the future, prompting providers to acknowledge and look for ways to clear obstacles to lowering breast-cancer risk for patients. That might mean helping a woman with care for an elderly family member or for her children, assisting with transportation or working to find a way to get her in to see a specialist, she said. The results of the study reveal the nuances of racial inequalities in health – the ways that structural, social and interpersonal inequalities combine to influence patients’ choices. Disparities are deeply rooted in social factors including poverty, education and racism that contribute to health outcomes, Padamsee said, adding that those obstacles aren’t insurmountable, but solutions are complex and slow-moving. A more immediate response to these inequities could be a focus on educating health care providers about the importance of providing risk-management information to all patients and referring high-risk women for genetic testing and specialist care. “All health care providers could be educated about the relevance of risk information and risk-management options for African-American women, and the current disparities in provision of this information across race,” wrote Padamsee and her co-authors. The disparities seen in this study might be even more profound in the general population, Padamsee said, noting that the women who were part of her research were actively engaged in health care and willing and able to participate in research. Ohio State graduate students Rachel Meadows and Megan Hils, who is now with the Centers for Disease Control and Prevention, also worked on the study. The study was supported by the National Cancer Institute. ACP is the preeminent national voice of continuity professionals, providing continuing professional development, knowledge and career opportunities to members while building public understanding around the world of the importance of continuity planning.